I don't go to sleep well. Once I'm there, I sleep like it's my job, but it's rare that I can hit the pillow and fall asleep within 2 minutes. I envy k-ster that he can close his eyes and be asleep in minutes. I have never taken a sleeping pill in my life. Warm milk does nothing. Chamomile tea doesn't really do much either and if I drink it too close to sleep, I have to go to the bathroom all night and never get to sleep. Let me introduce you to The Republic of Tea's Surrender to Sleep tea. O.M.G. 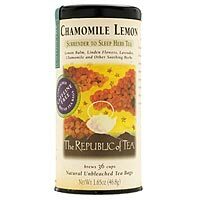 I have not been asked to review this tea or any tea by The Republic of Tea. But I would love to blog about your teas in a future post. Hint. Hint. I don't know what this tea is laced with, but it is pheNOMinal. I love the taste. Not tart lemon, not too much chamomile (which can taste like grass), but just right. And in about 30 minutes, I am practically drooling in my need to sleep. Most of the time. There have been a few times when there must have been some caffeine in my system that I didn't know about and it didn't work. But most of the time, all I can say is WOW. I don't know if it works if you are already frustrated that you aren't asleep and then you try to drink it to calm yourself. But it's like pure opium. I think, I have no idea. I highly recommend that if you would like to unwind before bed, and then sleep like it's what you were put on earth to do, you should drink this tea. Then come back in 2 posts and read my 100th post. I'm writing 100 things about myself as a tribute to the 100th episode of my blog. Hurry up and come back!! I am going to tell Tyler about this. He has a hard time, but usually drinks a little OJ before bed.